Just as the title promises, 500 Cookies is packed with delicious recipes for the home cook who has a weakness for the popular dessert. From peanut butter & praline chunk swirl cookies to coconut & cherry macaroons, each recipe is clear and easy to follow, as well as being beautifully photographed. There’s even a comprehensive introduction detailing techniques, equipment and ingredients needed to produce incredible cookies time and time again. 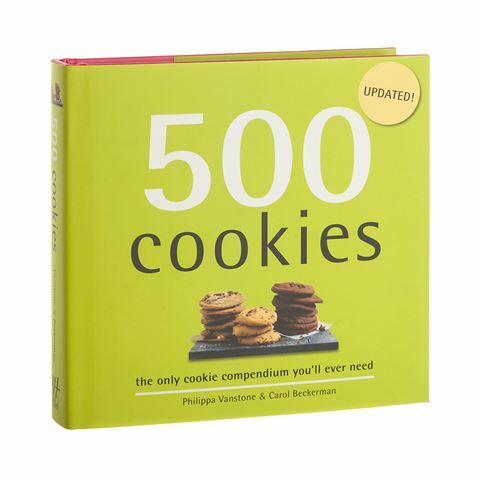 With 500 Cookies, you’ll never have to worry about what to cook ever again! Written by Philippa Vanstone and Carol Beckerman. Filled with recipes on a large variety of cookies. Recipes are divided into chapters – Classic Cookies, Coffee-Break Cookies, Cookies For Kids, Chocolate Cookies, Indulgent Cookies, Wholesome Healthy Cookies, Cookies For Special Diets, Cookie Bars, Dessert Cookies and Savoury Cookies. Begins with an introduction with essential equipment, ingredients and techniques. Features a full index at the back. Published by New Holland Publishing. Dimensions: 15.6cm (l) x 16cm (h) x 3cm (w).